What if you need to make dozens of calls? What if you need to load up a trunk group? What if you need to test a number port of hundreds of individual DIDs? What if you need to simulate calls from different areas of the country? What if you need to dial an extremely specific sequence of digits once connected, and you need to do this over-and-over-and-over? About a year ago, I found a great tool called CallsByCloud.com. This is an automated testing framework – completely self service using your browser. I liked it so much I became a business partner recommend it highly to all of you telecom administrators. I even recorded the training videos for them. It’s very straight-forward to use. You build a “test scenario” that contain simple “scripts” that are use cases for each type of call. If you’re testing a call center IVR, this could be “make payment” or “renew contract” or “queue for customer service”. 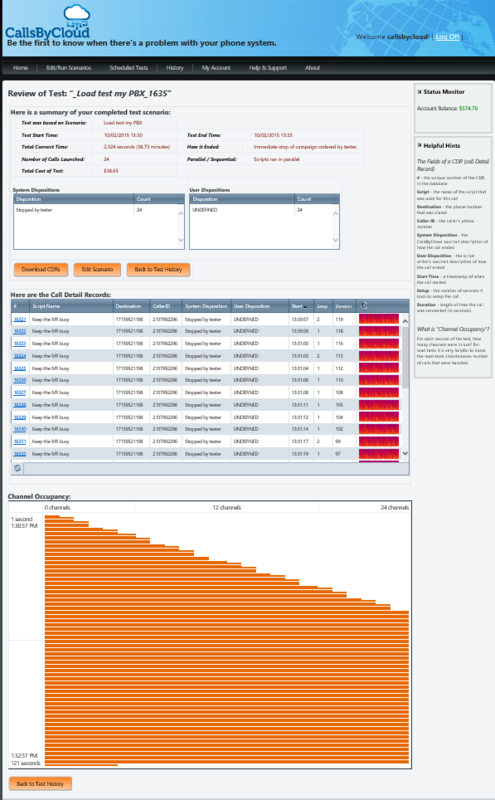 And if you’re just testing a trunk group, you can dial into your PBX and “hold” the channel for x seconds. This lets you load the trunk group and test overflow. Once the tests are complete, you can see the call history, channel usage, a spectrogram of the call, and you can listen to or download the audio. Once you set up a test, you can schedule it to run at a recurring time and alert you if there are any problems with the call. Caller-id manipulation to simulate geographic routing. Detailed logs of the call processing. Number pooling for testing multiple numbers. The ability to set a “disposition” or “goto” a different spot in the script based upon the timing of noise, silence, or DTMF in the channel. 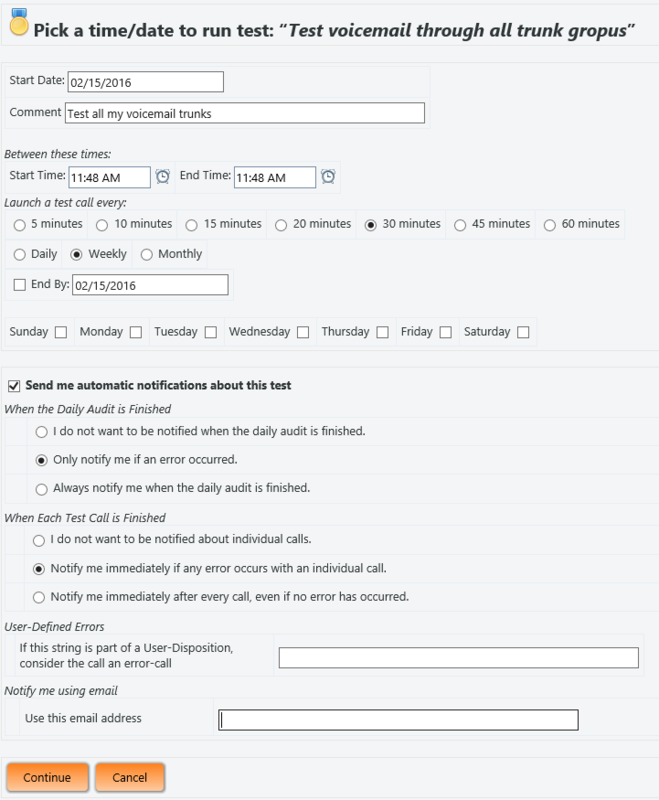 The ability to export call records for the tests. It’s flexible, cost effective, and has made my job so much easier. I recommend it highly to all of you. If you sign up and use the promotion code ‘roger2015’, you’ll get $10 in credit when you sign up and a 20% discount on the per-minute rate. Check out the training videos and let me know what you think! This entry was posted in Avaya, pbx, Uncategorized, voice on February 15, 2016 by roger. Hello everyone. I had a situation a while back where I needed to tell the 9630 phones in a remote office about a new call server. It was after-hours and I could not reach the network administrator responsible for the DHCP option strings for that site. I ended up creating a rewrite rule in Apache to redirect these phones to a different config file where I could overwrite the call server settings. Later I did the same thing for an international site where their date/time format was different from everyone else’s. You can also use the GROUP setting in the phone to load specific config information, but as one reader discovered, the GROUP settings are not available to SIP phones! If you’re using Apache to host your config files, here is how to re-direct those phones to custom files. As I look a this, the rewrite condition should probably start with a carrot ^ to try to match the beginning of the line, but it’s working for me so I don’t want to fiddle. But if I have a phone from 10.210.139.5, this rewrite will probably kick in because of that 10.139. within the IP address. Putting a carrot at the beginning should force it to only match addresses that begin with 10.139. Unfortunately, you’ll need to restart Apache, but the phones won’t care if they miss a PUT. Mine takes less than a second. I don’t think anything noticed. So then just create your SPAIN and OHIO settings files and the phone should get those. If it doesn’t seem to work, here are some troubleshooting steps. You’ll need to restart Apache again. There should be enough information in that rewrite.log to figure out what is happening. It’s a lot of information, so be sure to set the RewriteLogLevel to 0 when you’re done troubleshooting. I hope this helps! Please let me know how your testing is going. It would also be helpful to know if any of you get your GROUP settings to work over SIP. Thanks all! This entry was posted in Avaya on January 21, 2016 by roger. There are many reasons for the login to fail on System Manager. Version 6.3.x seems better but this thing still feels like it’s built on a house of cards. Tonight I just found another reason and it was new to me so I want to tell you all about it. Some internal error has occurred in the service. Please contact the support team. Guess who the support team is? Oh yeah, that’s us! Well, I didn’t really know what to do and it was a Sunday so I figured I would reboot it. Now my System Manager is a virtual machine and I don’t have access to the VMWare console. But I was able to SSH into System Manager as admin. Then su and enter the root password. From there, I was able to issue a reboot command. It dropped my session, and then it never did come back to ping. So I contacted my VM team and they rebooted it. Once they did that, I was able to ping and SSH to it. But the web page said “This page has a redirect loop”. I knew it could take a long time to come back up, so I gave it a while. But no dice. I contemplated rebooting it again, but rather than that, I went through the “ask Ava” chat pages on support.avaya.com. I was hoping with such a specific error like “redirect loop” I would find something and sure enough, Ava pointed me to SOLN270630, which was exactly my problem. According to this page, the Postgres certificate had expired. Avaya provided the command to confirm it and the command to fix it. All I had to do was run that command and then restart jboss. Then wait. Don’t forget, it can take 15-20 minutes for the restart to finish. Don’t panic. Actually, I think you do have to panic. Three minutes after you start to panic it comes back up. Don’t forget to re-enable Geographic Redundancy! root >openssl x509 -text -in /var/lib/pgsql/data/server.crt | grep "Not After"
Starting postgresql service: Waiting for Postmaster PID file creation . Waiting for Postmaster DB connection availability . This entry was posted in Avaya on October 25, 2015 by roger. Avaya CM – will I lose the CDR buffer if I busy/release the cdr link? I have an Avaya Communication Manager sending CDR to a kiwi syslog server. For some reason, the link is down and the buffer is filling up. What happens if I busy/release the CDR link? Will I lose the buffer? Scary! Short answer is no. I just tried it. I performed a busy/release on the primary CDR link and the buffer is still at 40%. Unfortunately, the link is still down so I’ll have to check with the syslog team. But I just wanted to let all of you know that it’s safe to restart the link. I ended up disabling and then enabling the TCP listener in Kiwi and the buffer immediately cleared. Is anyone interested in a post on how to capture CDR to a SYSLOG server? This entry was posted in Avaya, Avaya Stuff You Should Know on October 14, 2015 by roger. I recently had a problem logging into System Platform. I could not connect to the CDOM via the web, nor SSH into DOM0. Fortunately, there is a way to reboot the S8300D from the gateway itself. Log into the gateway as root, then type “configure” to get to the config menu. Then simply type “reset mm v1”, which will reboot the media module in slot V1. Confirm, and the card will reboot. From my understanding, it will cleanly shut down each VM and reboot. As always, it will take just long enough for you to panic, plus 45 seconds or so. This entry was posted in Avaya, Avaya Stuff You Should Know, pbx, voice on June 24, 2015 by roger. ERROR: traceSM is already running. Only one instance is allowed. This kills the old process and runs a new instance for me. Just another thing that sounds simple once you know it. This entry was posted in Avaya, Avaya Stuff You Should Know on May 12, 2015 by roger. This is almost an oxymoron. PRI interfaces are so common on PBXs that you’d think we would all be familiar with the process of building them. However, since these interfaces don’t change very often, sometimes we will go several years between PRI configuration. Here’s a quick reference for setting up a PRI. This one will use AT&T’s IPFlex BVoIP service, but most PRIs are configured the same way nowadays. Determine the physical location for the PRI (i.e. what port network or gateway and what slot?). Determine the trunk group number you will use and the TAC (trunk access code). Often, these will correspond with a site or media gateway. Just do a ‘list trunk’ and you’ll probably see a pattern where the trunk group number should fit and the TAC is almost always based upon the trunk group number. Find out the line coding and framing for the T1. Almost all T1s are now ‘b8zs’ and ‘esf’. Your carrier can confirm this, but I’ve never seen a voice PRI installed after the mid-1990s anything else. Find out the service protocol to use. This one is tricky and depends upon the emulation of the carrier’s switch. In fact, their planning docs will often ask you which one you want. And half the time it’s wrong anyway. If the D-channel doesn’t come up, this is usually the problem. It’s either ‘a’ for AT&T custom or ‘b’ for NI-2. It looks like this is used in three different places. The DS1 form, the signaling group form, and the trunk group form all have signaling protocol fields! However, the signaling and trunk group fields are different. When the carrier asks you “are you AT&T or NI2?”, they mean the ds1 itself. I have added some notes at the bottom of this post regarding the service protocols. There is a chicken-and-egg problem here. The signaling group wants to know what trunk group to use, but we haven’t built the trunk group yet. We will need to modify this after we create the trunk group. Now create the trunk group. After the first page, almost everything is fine with default values. The only fields I end up changing are “send name”, “send number”, and “show ANSWERED BY” on page 3. I typically submit the form before assigning channels on page 5 to make sure the form submits. Now, for the last step, let’s assign channels! Change the trunk group and set these on page 5 and 6. Note how we assign the signaling group along with the channel. When I get the circuit ID from AT&T, I will put it in the “Name” column along with the DIDs that were provided on this circuit. The “Level 3 State” is the state of the D-Channel. If you’re on the phone with your carrier and they ask about the D-Channel, you can give them that status. And if the D-channel still won’t come up, that’s when you tweak the service protocol values between ‘a’ and ‘b’. When you’re on the phone with your carrier trying to turn up service, the ability to bounce the D-Channel, monitor the D and B channel status, and change from AT&T custom to NI-2 is typically enough to get the carrier to work with you and get this working. On rare occasions you may need to tweak the line coding (b8zf/esf) but this has only happened to me once. As for service protocols, a good friend of mine provided a nice summary from his notes. Remember these apply to the DS1! (i.e. “change ds1 010v524”), not the sig or trunk group forms. Thanks as always for your time and attention. If you’re interested, I can include a post on routing incoming calls from this trunk group, routing calls out this trunk group, and setting the caller-id for calls over this trunk group. Please let me know your own experiences with setting up and using PRI and IP trunks. This entry was posted in Avaya on December 5, 2014 by roger.